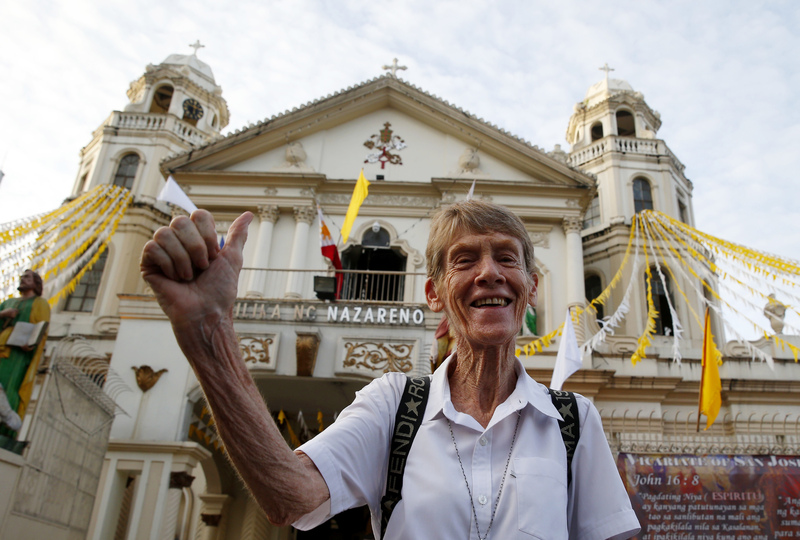 MANILA, Philippines (AP) — The Philippine immigration bureau on Thursday ordered the deportation of an Australian nun who has angered the president by joining anti-government rallies, but her lawyers called the move "persecution" and said they would appeal. The Bureau of Immigration also wants to prohibit Sister Patricia Anne Fox from returning to the country for violating the terms of her missionary visa. Justice Secretary Menardo Guevarra said Fox's deportation would not be enforced while she appeals. Last month, Guevarra revoked the Bureau of Immigration's cancellation of Fox's missionary visa but allowed the agency to proceed with efforts to deport her for another alleged offense. Fox, 71, is a coordinator of a Roman Catholic order of nuns and has worked for the poor in the Philippines for about 27 years. She advocates for human rights and workers' welfare and has joined rallies against President Rodrigo Duterte and his government, which has been criticized for stifling dissent and for its brutal war on illegal drugs in which thousands of mostly poor suspects have died. The immigration bureau said Fox violated her missionary visa by venturing far beyond her community in suburban Quezon city in metropolitan Manila and interfered in domestic politics by joining protests and news conferences that tackled "political and human rights issues against the government." "Her presence in the country poses a risk to public interest," it said. President Rodrigo Duterte has backed the immigration bureau's effort to expel Fox. Fox's lawyers said they were utterly dismayed and would appeal to fight "this kind of persecution." "Helping the poor is not a risk to public interest, peace or order. In fact, the government must recognize her selfless service to the oppressed sectors of this society," her lawyers said in a statement. The immigration bureau, however, said that allowing Fox to join political rallies and other such activities would allow other aliens to do so as well. Duterte has been hyper sensitive to criticisms especially by foreigners, who he says has no right to meddle in his country's domestic affairs. His bloody anti-drug crackdown has left thousands of suspects dead and alarmed human rights groups and Western governments. His administration barred a critical Italian politician, Giacomo Filibeck, from entering the Philippines in April. We, the Filipinos, beg for your prayers as the church, more of Catholics, is suffering from relentless persecution, terror, and deaths especially the poor. The country is tragically cripled with animosity and deep hatred between those whose efforts are rooted in peace and justice, and those whose hearts are turned like stones by total support, regardless of reason and compassion, of the evil ways of the present leadership of Duterte. May God help us and listen to our pleadings of mercy and justice.